Developed by industry leader Primera Technology, Bravo combines automated, robotic disc transportation with full-color printing in a compact, "all-in-one" desktop unit. Up to 25 discs per job (50 discs with Kiosk Mode) are automatically printed - hands-free and totally unattended! 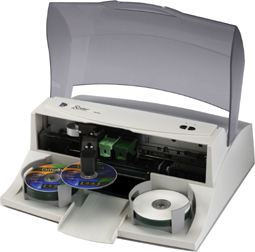 If you only need print capability, the new Bravo AutoPrinter is the perfect companion to your CD/DVD tower duplicator! The Bravo AutoPrinter makes it fast and easy to automatically print discs produced on the tower duplicator you may already own. With the Bravo Auto-Printer, you'll get gorgeous, full-color CDs and DVDs printed "hands-free" at up to 2400 dpi - at a price that's less than most other manual disc printers! Bravo incorporates the latest high-resolution inkjet printing technology. You'll be able to produce stunning graphics, photos and text with incredible, photo-realistic 2400 dpi print resolution. Using inexpensive and readily available printable-surface media, Bravo prints directly onto the surface of discs. This makes labeling faster, more professional looking, and helps to protect your valuable data. Bravo was designed from the start to produce not only standard 120mm CDs and DVDs, but also several of the most popular business card shaped and mini-CD formats. An optional adapter kit is required..
Bravo comes standard with 25 disc capacity, but with the newly designed Kiosk Mode you can copy and print up to 50 discs per job! For 50 disc capacity, simply load the input and output bins with blank discs. Finished discs will slide out the front of the unit. Kiosk Mode is included with all new Bravo systems as of May 1, 2003. For existing users, simply contact Primera's Technical Support Department for the free Kiosk Mode software upgrade. For a more professional look, choose the Bravo Kiosk Mode Kit which includes the Kiosk Mode software upgrade, metal tray and output bin to catch finished discs. Kiosk Mode is available for Bravo PC models only. From initial set-up to full operation, Bravo is simple to use. The professional SureThing™ CD Primera Edition for PC and Magic Mouse Production's Discus™ Labeling Software for Mac® make professional looking disc printing a snap with full-color backgrounds and built-in templates. Just connect Bravo to your Windows PC or Mac and you'll be duplicating and printing discs in just a few minutes.